The mission trip to Ecuador this last May was awesome. The country side and people are beautiful. It was a joy to spend time learning about their culture and providing medical care to the needy population of Ecuador in Otavalo, Santo Domingo de los Colorados, and Tsachila Communities. It was my first experience with a medical mission trip and it reaffirms my desire to be more involved in medical missions in the future. 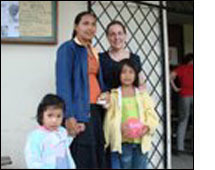 The first clinic was in Otavalo. CIMAS arranged for us to provide medical care to Ecuadorians in a school on a Sunday afternoon. The clinics coincided with a festival in the community. The children were dressed to participate in the parade and vendors were setting up to sell food and games. We set up the clinic using the school desks as our exam tables. Once we were set up, the people walked into clinic until dark. At the high elevation, many had eye damage visible from the wind and ultraviolet exposure. Most of the older women were complaining of difficulty with their vision, and body aches from their labor in the rose gardens. Multivitamins were provided to the pregnant women and children. Fluoride varnish was applied to the teeth of children, and toothbrushes with toothpaste were provided to encourage improved dental care. The people were very friendly and appreciative of the medical care provided. Our second clinic was in Santo Domingo at the Shoulder to Shoulder Clinic. We did two days of clinic there. The clinic is located in a poorer part of Santo Domingo and was primarily aimed at providing care to those close to the clinic. Again we provided dental care, fluoride varnishes along with toothbrushes and toothpaste. I saw primarily children at this clinic. Most had simple problems like colds, sore throats, and UTIs. There were two children who came to the clinic with dog bites. It was a little nicer having the capabilities to send stool studies for the concern for worms as opposed to treating based on symptoms. This was the only clinic with these capablilities. The last clinic was in the indigenous population, the Tsachilas. We held our clinic in one of their local churches. They also shared their culture with us, by telling us about their woven skirts, and their hair styles. I saw one patient who had a VP shunt placed at 8 days of life. The mother was worried about nutrition of her child. He was 4 years old and was the size of a 1 year old. She was feeding him mashed food three times a day. She was doing an excellent job taking care of her child under the circumstances in which she lived. I had the opportunity of counseling her on ways to increase the calories of her child and discuss supplements available to her through the Ecuadorian government. Again, they were very appreciative of the medical care provided. In the four days of clinics with two separate teams we saw a total of 1,000 patients. It was a very efficiently organized trip. It seems to be a unique situation where the mission group partners with the native people in the area to provide care to those who are most in need. My hope remains, that I will be in a position in the future to be a part of a mission group to provide medical care to those most in need.